What is the Fundamental Unit of Curriculum? In terms of being readily shareable between teachers, schools and districts, what is the fundamental unit of curriculum: the task, the lesson, the unit, or something else? Kate didn’t necessarily make the case that units are what we should be sharing, but she presented her work with Illustrative Mathematics and a number of teachers building unit blueprints. I was impressed with their work. Each unit is identified with Common Core standards, details what knowledge students need before the unit, tells the story of what students will learn during the unit, and provides a number of resources — assessment items, tasks along the lines of what Geoff Krall put together in his curriculum maps, and other resources — the project is unfinished, Kate said that the high school project is wrapping up now, and 6-8 is farther behind but well in the works. The curriculum also mapped out which units would fit in Algebra I/Geometry/Algebra II vs Integrated I/II/III to show where units might fit. 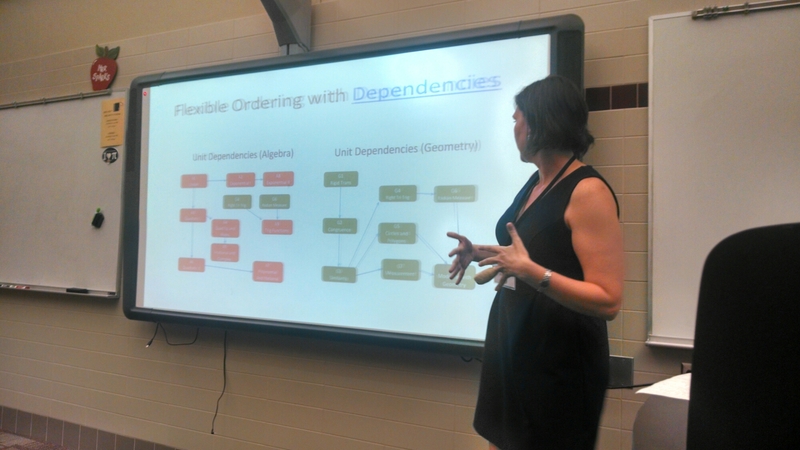 She also talked about how the curriculum is designed to be agnostic on pedagogy, so that it could be implemented in a project-based setting, problem-based setting, or direct instruction, and could be used with standards-based grading or traditional grading. I think this project sounds awesome, and I’m excited to see what the final product looks like. I’m sure I’ll use it as a reference for my curriculum planning, and based on the number of people in the room at Kate’s session who are largely figuring curriculum out themselves and not being given a canned curriculum, it sounds like lots of other teachers could use this as well. To return to my question — I’m worried that, while this project will be awesome, it will largely go unused. The same way the vast majority of math teachers don’t use Dan Meyer’s 3-act tasks, or openmiddle.com, or visualpatterns.org, or Robert Kaplinsky’s lessons, or a huge number of other awesome resources that exist on the internet. My question is, at what grain size are instructional resources most easily shared? Some websites are focused on sharing great problems. Others focus on tasks that could form the basis of part of a class, or a whole class, or in some cases several classes. Some focus more explicitly on “lessons” — Mathalicious comes to mind, while the Shell Center’s lessons often span several days. This project is trying to put together a unit blueprint, but is less prescriptive than some other resources. There isn’t a great example I know about of an online resource or set of resources that teachers use across the country, so I don’t have any evidence for what works. I hope this project takes off, because I really believe it will be awesome. But I also know that 3-act tasks are awesome, and there are a huge number of them on the internet, and I don’t think they have nearly the type of name recognition in the average math classroom that they deserve. I don’t know the answer to my question. I’ve been doing a lot of thinking about this topic lately, inspired in part by Mr. Honner’s grand challenge to NCTM for a free, modular curriculum. I think one resource that is sorely lacking that would make a big difference for quality instruction would be great problems for students to explore new problems. That said, the smaller the grain size, the more work it is for teachers to adapt and make into a lesson plan. Kate’s project is ambitious, and it’s awesome, and I can’t wait to see the final project. This entry was posted in TMC on July 25, 2014 by dkane47. Thanks for the thoughtful writeup. Your question is so important, and I certainly don’t have a great response. 🙂 Though I’m interested to see how folks respond. One thing I wanted to clarify, though, I’m way uncomfortable with calling this “Kate’s project.” Although I’m sure it was just shorthand and you weren’t trying to credit me, it wasn’t my idea, and I’m only one of about twenty people who can claim to have contributed. I was just, for TMC purposes, the most sensible choice to share it with you guys. Thanks for the clarification, Kate. Does the project have a formal name that we can look for later this year when it’s released, or do I just have to keep clicking refresh on your blog until then? Hi, Dylan, nice summary. Your blog is one of my favorite new ones that I found after TMC14. I’m actively working to incorporate PBL into my new Common Core Alg 1 class and you do a GREAT job of summarizing what’s out there and commenting on it. I was also at Kate’s curriculum development talk, I am the lady who commented at the end about how we are going to get all this good work out there so people don’t just buy another textbook. Nice blogs like yours go a long way towards making that happen.